As a member of the Muslims of the Americas Department of Health and Wellness, we are always concerned with the well-being of every member of our communities, regardless of faith. For this reason, we expend great effort in trying to keep the public informed of helpful tips regarding disease and preventive health maintenance. Currently, the topics of obesity and diet are prevalent in healthcare; therefore, we are particularly mindful in sharing beneficial information regarding these. I have recently received numerous requests for an effective diet plan and consequently, I have compiled a list of things that I have recommended in the past, and which you must know and implement in order to be successful in dieting. Over the years, this information has brought a great deal of success to many who have put it into practice. Firstly, the most important thing to determine before starting any diet plan is your reason for dieting. This may seem trivial, but if you do not have a compelling reason, dieting many times ends in failure. In America, the two prevailing reasons people initiate diets are for improving health and for increasing aesthetic appeal. Most of the time it is for the latter and this often ends in failure and frustration. The leading causes of failure are that people often ascribe to get-slim-quick schemes—and even worse, to various forms of extreme surgeries—to shed pounds. Just like all things in life, there is a balance; so if you can find a reason that is somewhere in between, then you may enjoy more success in dieting. Next, we need to clear up the diet-versus-exercise myth. Currently, many people think if they exercise often that they can eat whatever they want, essentially placing equal importance on diet and exercise. This is, by far, the main reason people fail. Losing weight and burning fat is 90% diet and 10% exercise, therefore, making appropriate food choices and eating less are far more important than hitting the gym! The last thing you need to know is the importance of blood sugar levels. If you know anything about diabetes, then you know the importance of controlling your blood sugar. In dieting, it is equally important. If you are constantly 110 mg/dl (units for measuring blood sugar), you put your body in fat-production mode. Hence, your body will try to make fat out of anything you eat. If you maintain a blood sugar count of around 80mg/dl, your body will be in a state where it burns fat. This is why people complain that they have reduced their portions and have made better nutrition choices, yet have not lost any weight. It is likely because of maintaining high blood sugar levels. Now that we know some things about diet in theory, what kind of things can we implement in our current approaches to nutrition that may work? The first thing to do is replace everything you drink with water. The easiest way we pick up unwanted calories is by drinking sodas and juices (that’s right, I said juices! They may have health benefits, but they add calories). An additional benefit is that water dilutes your blood sugar, which will help you stay in fat-burning mode. Next thing to do is remove ALL processed bread from your diet. One of the easiest ways to do this is to use pieces of lettuce as the “bread” and eliminate the actual slices of evil from your sandwiches. Now, for all you peanut butter and jelly people, don’t knock it until you try it. 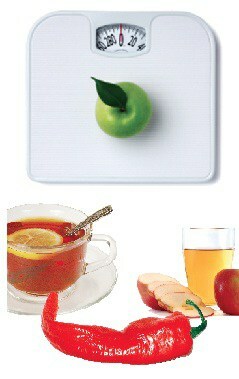 Last, but not least, here are a few things to add to your diet: green tea, cayenne pepper, and apple cider vinegar. The cayenne can be sprinkled on any type of food and it serves to increase your metabolism, sometimes by 25 percent. The vinegar should be taken by the teaspoon after every meal and it helps you get rid of any of the fat you may have consumed. The green tea should be the natural leaf variety (often sold in boxes as ‘gunpowder’ green tea) that needs to be prepared and strained. Its appetite suppressing qualities would probably be enhanced if you do not sweeten it (this will also help keep your blood sugar level down). Drink a hot cup in the morning and in the evening. If I add one more thing to the list, it will be nine things instead of eight, as stated in the title; so I purposely left off the idea of fasting. This is done strictly to confer spiritual benefits and as such, is not part of dieting. If the consequence is that you lose weight, then it is so. However, fasting should never be undertaken for the ephemeral reason of weight loss. In closing, following this simple approach to dieting can produce long-term results. You may notice that you will not only lose weight, you will probably improve your bowel health, have increased energy, experience less stress and enjoy an improvement in mental well-being. And as always, only by God, The Almighty and All-Glorious, can we be healed. Green Tea, Cayenne Pepper, and Apple Cider Vinegar, may help suppress appetite, burn fat, and increase metabolism.